I am still in the midst of considering and perhaps adopting the Conditionalist view of hell, which is that those who reject Christ are punished according to their deeds, then annihilated – that is, they cease existing rather than entering into eternal life. I am coming to this conclusion based on scriptural exegesis, not personal preference, and I am not alone – just visit rethinkinghell.com and see the growing Conditionalist movement within evangelicalism. 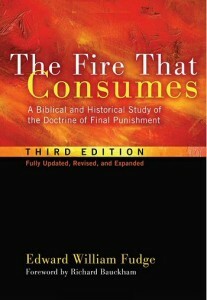 One of the classic books supporting this theological position is Eward Fudge’s The Fire That Consumes: A Biblical and Historical Study of the Doctrine of Final Punishment, Third Edition. The story of how Fudge came to write this book has been made into a movie called Hell and Mr. Fudge. Check out the trailer below. Hell and Mr. Fudge Trailer from Jim Wood on Vimeo. Dan – What is the driver to consider or possibly adopt the Conditionalists view? Is the traditional doctrine of hell too much to reconcile? I am just curious. The greatest reason to consider the view is that it may be a more accurate interpretation of the text – we want to ‘rightly divide the word of truth.’ While every interpretation may have some open questions, the Conditionalist view obeys Occam’s razor, that is, it is a simpler, less convoluted answer – it’s a more straight forward reading of the text. So when, for example, Jesus says “And do not fear those who kill the body but cannot kill the soul. But rather fear Him who is able to destroy both soul and body in hell” (Mt. 10:25-27), we don’t have to explain that ‘destroy’ actually means eternal separation from God – it just means ‘destroy’! A second reason to reconsider it is that we claim that God is just, but the perceived injustice of punishing someone for eternity for sins performed in a short life seems out of balance – that is, it violates the law of reciprocity. Does the eternal torment view actually violate justice? Not that this is a good enough reason to doubt eternal torment, but my experience is one of relief that I do not have to justify the ‘injustice’ of eternal hell anymore – instead, God will ” repay each person according to what he has done” (Mt. 16:27), and then, after this just punishment, the person’s existence is over, and they fail to enter into eternal life. I have outlined and defended the traditional view, and why it may be just, in Why eternal punishment?. I also discussed/explained/examined/defended the traditional view in What good does eternal punishment accomplish?